Brighton-bound Sam Morrow's Concrete and Mud is a confident album, rooted in Texas twang, southern stomp, and old-school funky-tonk. Recorded largely live in the studio on a vintage Neve 8068 console with producer/engineer Eric Corne at the helm, it also shines a light on Morrow's strength as an artist. At 27 years old, the L.A.-based, Houston, native found his footing as an artist and appears poised to join the ranks of West Coast heavyweights like Sam Outlaw, Jade Jackson, and Morrow's friend and label mate, Jaime Wyatt, whose vocals can be heard on three of the album's songs. Concrete and Mud "is about the fabric of America, and how the Mississippi is a metaphor for what binds very different people together," says Morrow, whose album builds a similar bridge between opposing camps: country and rock & roll; the West Coast and the American South, concrete and mud. "The sentiment is," he adds, "the things that unite us are stronger than the forces that divide us." The sad-eyed sounds of Ephemeral and its 2015 follow-up, There Is No Map — both written during the early years of Morrow's sobriety — have been replaced by something more representative of his live show, in which he fronts a band of plugged-in roots-rockers. Accordingly, Concrete and Mud doubles down on a blend of countrified funk and guitar-fueled southern rock, shot through with train beats, Telecaster twang, bluesy slide guitar, swirling organ, with Morrow's big, booming voice front and center. There's balance, too. 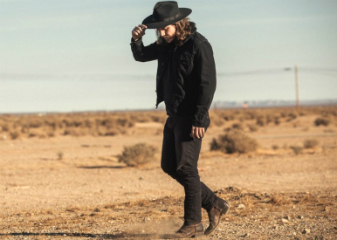 For every swaggering country rocker there's a captivating, emotional punch to the gut. Paid by the Mile is full of 70s-worthy stomp and Southern swagger. Quick Fix is an infectious hook laden stew of syncopated beats with bubbling clavinet, slinky guitars and doubled vocals. Morrow croons one minute and growls the next with a sly nod to his influences while staking out new territory. Sam Morrow & band play The Prince Albert, Brighton, on Monday 21st January 2019. CLICK HERE for tickets.